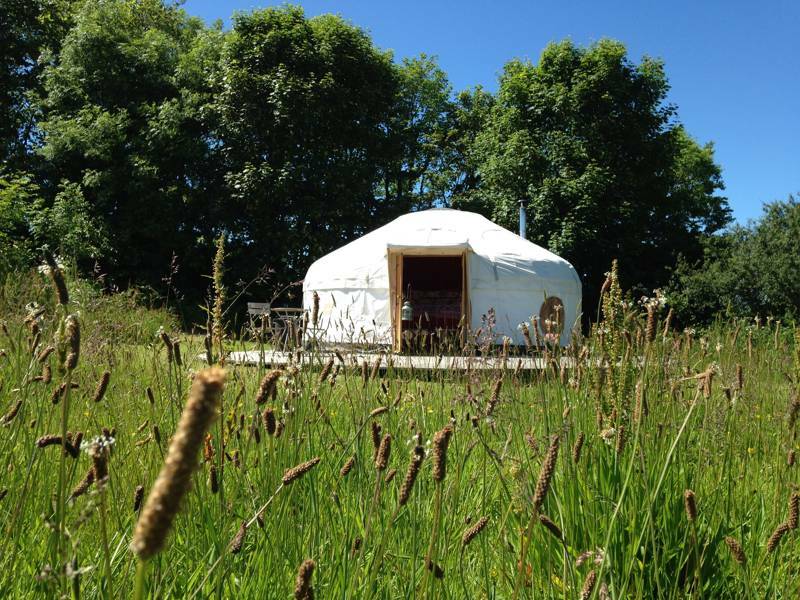 Lovingly furnished 18ft Mongolian-style yurt just moments from one of Cornwall's finest beaches. We have four 18ft Mongolian-style yurts which each sleep up to 5 people. All have their own unique character and are furnished with sumptuous feather duvets, beautiful linen and unique quilts. They have a wood-burning stove to keep you warm on cooler evenings. Solar powered fairy lights add to the magical atmosphere. The yurts are well spaced apart to give you a feeling of seclusion, you won’t feel that you’re disturbing someone. Each yurt has its own authentic fire pit with a tripod stand so if you are feeling adventurous you can cook over an open fire or toast marshmallows under the stars at night. Our wood-fired hot tub is a wonderful place to relax under the stars. Bathroom facilities are housed in a listed granary which include hot showers, flushing loos and wash basins. Each kitchen is shared between 2 yurts and includes Camping gas stoves, A fridge for each yurt, Microwave, Electric toaster, Electric kettle, Crockery, cutlery, utensils, pots and pans Tea towels, pot scourers, dish clothes, and washing up liquid. There is a charcoal and gas BBQ available outside. Alternatively you can cook over an open fire.